Without question, the early 1990s was a special time in the history of R&B for pioneering male vocal groups. From the doo-wop-inspired stylings of Boyz II Men to the gritty edge of Jodeci and the smooth tones of Shai, the male soul soundscape offered a little something for everyone. Of a particularly classy ilk, Atlanta-based trio After 7 wooed listeners of both sexes and multiple generations with its sensitive yet straightforward combination of soulful harmonies, timeless melodies, and authentic lyrical canvases. Whether reassuring the ladies in quiet-storm mode on “Ready or Not,” keeping things both funky and poppy on the irresistible “Can’t Stop,” or making old-school goodness hip again on “Gonna Love You Right,” Kevon and Melvin Edmonds (both brothers of Babyface) and Keith Mitchell left a solid legacy over the course of merely three albums. 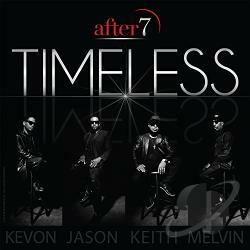 20 years after their last CD together, Kevon and Keith have reteamed with Melvin’s son, Jason, to reassure fans that the After 7 sound is stronger and more relevant than it was in 1997—when the guys disbanded following a lovely rendition of Hall & Oates’ “Sara Smile.” Kevon has remained the most active since, releasing two solo albums; his passionate, gliding tenor touch is as zesty and tender as ever on Timeless, with Jason bringing a full-bodied flavor to the mix that fits right in with the group dynamic. This is especially evident on the moody midtempo selection, “Too Late,” which could have easily come out in the mid-‘90s, but stands firm on its musical merits without resorting to any overt throwback efforts. Timeless was previewed last year via the smooth, lightly jazzy “I Want You,” which also features Melvin and Babyface (and was included on Face’s own Return of the Tender Lover). Glowing with an earnest chorus that resounds with positivity backed by an engaging groove, the song will likely stand out as the centerpiece of the album to much of After 7’s audience. However, each cut is merited, making the short and sweet 10-song set a fully pleasing listening experience with no filler to be found. It’s almost entirely an original affair, with just one remake included for good measure. Those who reveled in the guys’ 1992 medley of “Baby I’m for Real” and “Natural High” will surely cherish the charming cover of The Stylistics’ 1971 classic, “Betcha by Golly Wow.” Although the tune should arguably not be touched (no disrespect to Prince’s 1996 version), remarkable care is shown here in both the simple arrangement and Kevon’s breathtaking reading of the majestic lyrics. In 1990, “Can’t Stop” was one of two gold-certified singles from After 7’s debut disc to cross over to the pop top-ten. In the feel-good spirit of that jam (not to mention 1992’s “Kickin’ It”), “Lovin’ You All My Life” boasts a summery hook and impressive vocal chemistry between Kevon and Jason—paralleling the phrasing trade-offs that the former engaged in with Melvin on those earlier hits. On a more intimate note, the sultry “More Than Friends” keeps the rhythm tight, but pulls the listener in with low-key programming and seductive verses reveling in the blossoming of a sensual connection. Its tasteful exploration of the considerations involved in the consummation of a partnership is complemented nicely by the alluring production. Rounding out Timeless, the humble and affectional ballad “Home” has a back-to-basics compositional quality illuminating “a place where I was taught about love.” Kevon’s understated delivery of the words melds seamlessly with soft piano fills and peaceful acoustic embellishments. It’s a soothing closer to an album that is easy on the ears, yet replete with heart and soul, from beginning to end. And it leaves one hoping that the next After 7 album will come sooner than later. Highly recommended.